RoyalEnfields.com: A big, cheap motor for your Royal Enfield? A big, cheap motor for your Royal Enfield? Royal Enfield owners on the Yahoo message board seem more and more interested lately in kits to convert their 500cc Bullets to 612cc, an undertaking that requires a lot of money and a lot of determination. Those who have done it rhapsodize about a Royal Enfield that is not just more powerful, but vastly more gratifying. However, when 612 owner CJay estimated that the conversion cost "$10,000+," I was forced to wonder: Why not replace the Bullet engine with a larger, used Japanese motor? Just such a bike has been languishing for sale on CraigsList and now eBay at an asking price of as little as $1,000. The discussion has been interesting. 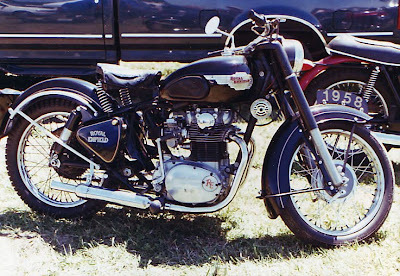 No one who has converted to an all-Enfield 612 would be satisfied with a Japanese motor. "Jeri" pointed out that a perfectly good Japanese motor could just as easily stay in its perfectly good Japanese motorcycle and serve as well! "Here is one I saw at Mid-Ohio several years ago. It was quite a tidy machine and the motor fit like it was made for it. I suspect most onlookers had no idea they were looking at a mongrel. If one had access to an XS650 lump and an engineless Bullet chassis, I think this would be a fun project. The resulting bike would be neither Bullet nor Yam, but something altogether different. Cheaper than a 612! This one had both foot brake and shift on the left, while the right foot got an easy life." quote: "Starting with a new bullet off the show room floor and adding the 612 kit and all the other bits to make the job right plus machine shop labor or special tooling if you DIY, you are looking at $10,000+." Not the conversion itself costs 10,000+! It's the sum of the above mentioned when you build it from zero. And again David a Royal Enfield Bullet is made of a Royal Enfield Bullet plus one or another improvement made for "it". Its not made of japanese yoghurt cup parts. 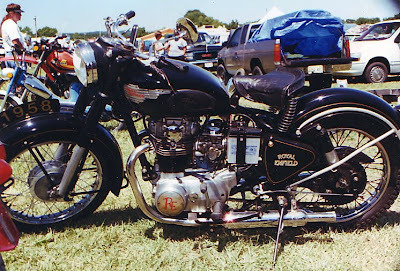 The Enfield Diesel's were always made of a Bullet plus an engine from a diesel engine manufacturer like Greaves Cotton, Ruggerini, Lombardini, Yanmar, Hatz etc.. I believe you are correct. Temptation aside, at the end of the day, the Bullet is about satisfying the soul, not getting someplace faster. Thank you for your comment.